Many have tried and failed, so for the record, what’s the secret to talking like Bizarro? I minored in it at college actually. My accent gives away my formal training, though. 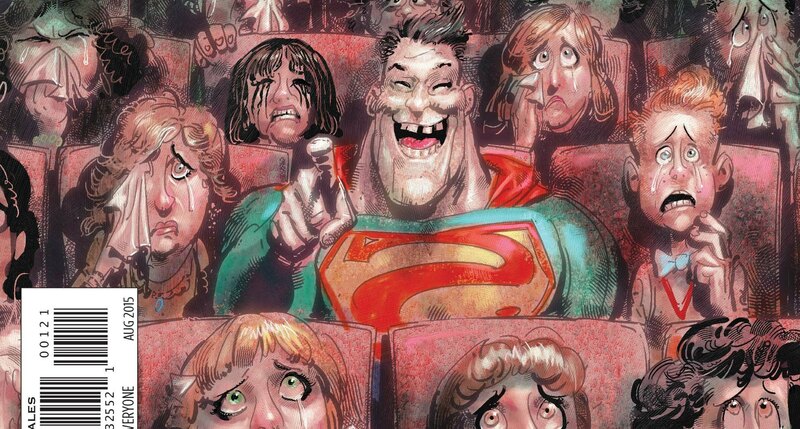 With so many reviewers and fans mimicking Bizarro’s whole opposite thing, are you worried that you’re not going to be able to tell for sure which reviews are positive and which are negative? No… I mean, yes! Wait… What was the question? I figure there’s no downside. Positive or negative, I can just pretend they’re all good. It’s especially helpful on Twitter, where everyone is apparently Bizarro-talking about each other all the time. Have you always wanted to write a Bizarro story? I’ve always wanted to write comics. When I came up with the Bizarro pitch, it was the dead LAST idea of a list of like eight of them. Because I thought the idea was crazy enough to get a laugh but I never thought anyone at DC would be crazy enough to let me do it! Turns out I was wrong. Happily so. This story is something of a road trip with Bizarro and Jimmy Olsen. If you were going on a road trip with Bizarro, what would you pack? Oooh. You can’t second-guess Bizarro. He’s pretty unpredictable. I think you have to just cover all the bases and bring an umbrella, swim trunks, penicillin, good walking shoes, cash for bail, a bunch of extra underwear… And your Superman signal watch. Y’know, just in case. The artist on this series, Gustavo Duarte, has a great comedic style. What’s the process been like working with him? Gustavo is an amazing partner. I cannot say it enough. I’m beginning to think that the story and dialogue is just a delivery system for Gustavo’s art. For real. I’m such a huge fan. We text or Skype each other pretty much every day, bouncing gags and panels and riffing off each other. Just making each other laugh, which is a great way to work in comedy. We both came into it with such a clear shared vision for the characters and their dynamic. Plus a fondness and nostalgia for the history of DC Comics, which I think you can see it pretty clearly in the work. Of the new titles launching in June, there’s a surprising number of humorous ones. Humor’s been largely missing from super hero comics for a while. Why the sudden resurgence, do you think? What I love about the new titles, as a fan as well as a creator, is that there really is something for everyone. Comic readers deserve a well-balanced diet, I think. And that means consuming more than just one style of storytelling. What does that mean? Look, I love eating steak. But if you told me all I could have was steak all the time, I would immediately crave something else. Part of that is clearly my “problem with authority” character flaw, but the other part is human nature in search of balance. Humor books are very much part of that balance… Probably dessert. Fans may or may not know this, but you actually have a ton of experience writing DC Super Heroes, only it’s been for animated movies like Justice League: War and Batman: Assault on Arkham rather than comics. Has it been at all difficult making the switch to comics? What have been some of the bigger differences? It’s been different for certain. But a good kind of different. I had to wrap my head around diverse ways to tell story. Where animation is all about the flow and movement, comic panels are about catching the strobe pop of action from moment to moment. One emotion per panel. I’m also becoming hyper-aware of overwriting dialogue. I love to have Jimmy and Bizarro banter back and forth… But where in an animated movie I could have them just go, in a comic I realize I’m crowding the panel and obscuring Gustavo’s great art. So that’s forcing me to be super specific. Even as a child, Heath's taste in costumes was rather...bizarre. Finally, how do you suppose Bizarro would go about convincing people to read his comic? Bizarro wants to be liked so badly that if you were on the fence about the series, he would offer to come over and read the entire first issue to you. Then he’d ask what smelled so terrible in the kitchen and you’d have to invite him to stay for dinner. Then he’d make himself comfortable on the couch and watch some TV really, really loudly with you, laughing at all the wrong places. And then fall asleep with his huge head on your shoulder during the news and snore. Oh, he’d be gone in the morning but he’d be back once issue #2 came out, prepared to do it all over again. And he’ll do that with everyone in the world who doesn’t buy his comic. So, do yourself a favor and pick up a copy. You’ll thank me later. Have a question for Heath Corson? You're in luck! Heath will be taking over the DC Comics Twitter for a one-hour Q & A tomorrow, June 5th, starting at 1 p.m. PST. Ask your questions for Heath using the hashtag #ChatBizarro. BIZARRO #1 by Heath Corson and Gustavo Duarte is now available in print and as a digital download.